Hello Guys! The sun is shining in London today but that's not all! Today is my last working day for August as I'll be on a 2-week holiday soon! Woopie! Don't get me wrong, I love my job (more on that HERE). There's just days that you need to take a hiatus on things so you'll appreciate them better. 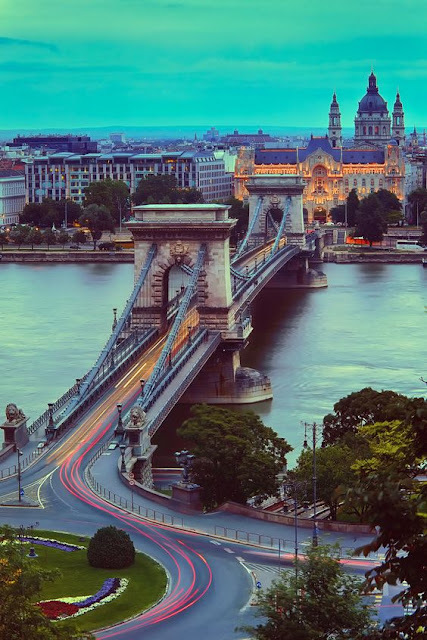 Picture above is the chain bridge in Budapest (Thanks Pinterest!). Our plan is to visit Austria, Hungary and Slovenia in that order. It will be an early flight tomorrow (hello London Heathrow Airport) and I haven't packed my stuff yet! I've already made a list though. It's going to be exciting because I've never set foot on these countries ever. It will be a new experience, that's for sure! In another news, I've been loving Veet's waxing solution, Marks & Spencers bath cream, Zumba classes, Blindspot series, strawberry banana chia pudding and green smoothie with ginger.